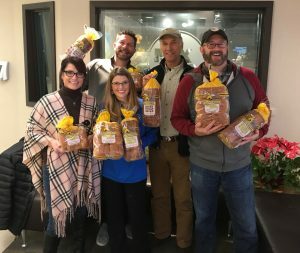 CINCINNATI (January 15, 2018) – Klosterman Baking Company, a family-owned bakery headquartered in Cincinnati, relies on fresh honey and grain to create high-quality breads to feed the community and the honeybee that makes it possible to grow these crops. The bakery is launching its inaugural Save our Bees campaign in partnership with the Cincinnati Zoo & Botanical Garden. Their goal is to raise $10,000 for Pollen Nation, the Zoo’s Pollinator Program. With this donation, Klosterman will provide honeybee hives for Bowyer Farm, a portion of the Zoo’s Bowyer Farm in Warren County, to boost the declining honeybee population and raise awareness of conservation actions we can all take. Pollen Nation established honeybee hives in 2015 to boost the declining bee population and works to raise awareness of conservation actions everyone can take to save bees and other pollinators. On January 21, the campaign kicks off with Save Our Bees branded Honey Bread, Bun and Roll varieties in grocery stores throughout Greater Cincinnati and Dayton, with a portion of proceeds from sales benefitting Pollen Nation. Consumers can show their support of the campaign from Klosterman Baking Co. and the Cincinnati Zoo by purchasing any one of the specially marked Save our Bees items. Honeybees do more than just pollinate flowers and make honey. They also pollinate a third of the world’s crops and are critical to our agriculture system, said Cincinnati Zoo & Botanical Garden Director Thane Maynard. Consumers can look for Save Our Bees varieties in grocery stores across the Cincinnati and Dayton regions. A portion of the proceeds from the sale of Klosterman Rich ‘n Good Honey Hamburger Buns, Hot Dog Buns, Dinner Rolls, White Bread and Wheat Bread will be donated directly to Cincinnati Zoo’s Pollen Nation program. Klosterman Baking Co. is excited to continue this partnership with the Cincinnati Zoo throughout the year, including a Pollen Nation Celebration in June for Cincinnati Zoo member-families and the public to see what all the buzz is about at Bowyer Farm in conjunction with the Zoo’s annual Native Plant Sale. More details about the celebration will be released soon. More information can be found at klostermanbakery.com/saveourbees. « Free Travel Information Night at the Cincinnati Zoo February 13!